Every Day 9:00 a.m. 6:00 p.m.
You've never seen so many big touring features packed into such a light, easy-handling machine. The pavement doesn’t stop at the city limits: If ever a motorcycle could turn a trip to the corner store into a cross-country trek, the SuperLow® 1200T model is the one. You’ve got a light, nimble frame for easy handling. Detachable windshield and lockable saddlebags for the open road. A seat for all-day comfort. And a low center of gravity coupled with suspension that lets you eat tight city traffic and twisting miles of highway with equal ease. Fire it up. See where it takes you. Authentic Styling: When the first Sportster motorcycle roared onto the scene in 1957 the world had never seen anything like it. Rawboned, powerful and looking for action. The styling cues that lit up the street in those early years would soon become a part of everything from race bikes to outlaw choppers as they spread throughout the motorcycling world. Take a look at the offering for 2017 and one thing becomes instantly clear. The best way to get the style that made the Sportster motorcycle famous is to get a Sportster motorcycle of your own. The narrow frame is more agile than ever. The rumbling V-Twin and muscular front end feel more powerful than ever. The flawless steel and jewel-like fuel tank reveal their authentic motorcycle roots in every inch of detail. Iconic Engine: The Evolution engine riding in the nimble Sportster frame is a prime example of the power, durability and proven reliability The Motor Company was built on. Born from the legendary Shovelhead and Ironhead engines, it’s been the power at the center of a Sportster motorcycle since 1984. Its overhead valve design and four-cam gear train have their roots in the company’s race program, and you know it when you feel the surge of brute torque that accompanies every twist of the throttle. The air-cooled V-Twin design with a compact one-piece crankcase/transmission fits the narrow Sportster profile like a fist in a fingerless glove. We began with a strong, trouble-free design. Then gave it constant refinement to bring us to the modern powerplant of today. A testament to the unwavering hunger for advancement in motor technology that has always driven Harley-Davidson. Handling: The street is the home turf of the Sportster motorcycle, and a narrow, agile frame wrapped around a strong V-Twin engine has always been its calling card. To see how far we’ve taken this basic equation, get in the saddle of any 2017 Sportster model. Trust us, the list of constant innovations and refinements you experience on the Sportster motorcycle of today is more than you want to read about here. The latest innovation includes suspension on every model, with cartridge emulsion rear shocks and a screw adjuster to further dial in the handling. It all feels tight and right, bringing confidence to the ride and a grin to the rider. Whether you’re rocketing to the next stoplight, threading through the urban grid, or busting out of the city limits to parts unknown. Comfort: You might look at the raw-boned style of a Sportster motorcycle and not immediately think of comfort. That would be a mistake. Sink into the seat of any 2017 Sportster model and you discover a premium ride hidden under all the lean and mean styling. The engine is rubber-mounted to the frame, so you feel all the power of an Evolution V-Twin but none of the vibrations. The handlebar hits your fists and the pegs hit your boots just the way they should. Even better, we’ve made improving comfort for the Sportster rider our marching orders. With a wrench tucked inside the seat to adjust the rear suspension exactly the way you like it, these are some of the most versatile motorcycles to ever hit the street. Premium Styling Features: There’s only one way to build a Harley-Davidson® motorcycle: premium to the final detail. The SuperLow® 1200T model is a rolling testament to that fact. From the true, awesome rumble of the 1200cc V-Twin engine to the steel parts to the premium paint and flawless chrome, this motorcycle is every inch a Harley-Davidson® motorcycle. And you will recognize the value of that more with each passing mile. True Custom Finish: Let your eyes take a trip over The SuperLow® 1200T model and you’ll notice a chrome air cleaner cover emblazoned with the words “1200 Sportster”, a chrome headlamp visor, chrome speedo and chrome rear turn signal bar, and a black and chrome timer cover. Details like this put plenty of distance between the SuperLow® 1200T and the average ride. Teardrop Fuel Tank: The 4.5-gallon teardrop fuel tank on the SuperLow® 1200T model means you’ve got plenty of fuel for those long stretches between towns. But a Harley-Davidson® fuel tank has to do more than just hold fuel. This is a fuel tank designed the way only Harley can do it. With classic lines, a smooth curve around the bottom edge instead of a cheap-looking metal ridge, and mounted to leave a good amount of room to showcase the engine. Quick Release Windshield: The SuperLow® 1200T model is built for long miles on the highway, but it strips down quickly for a cleaner look. Or when you just want to feel a little more wind. Split 5-Spoke Cast Aluminum Wheels: The SuperLow® 1200T motorcycle rolls on painted black and machine polished for a premium finish. Why say more? These wheels speak for themselves. Lockable Saddlebags, Docking Points for Sissybar and Luggage Rack: You've got a pair of sleek, lockable saddlebags on the SuperLow® 1200T model. You also have docking points that make it easy to add a custom luggage rack and sissy bar to give you even more places to pack your gear. Who says a bike can't look good and still pack up for big miles? Closed Loop Exhaust System: Designed to meet future worldwide emissions standards and the standards of future generations of Harley-Davidson® motorcycle riders. 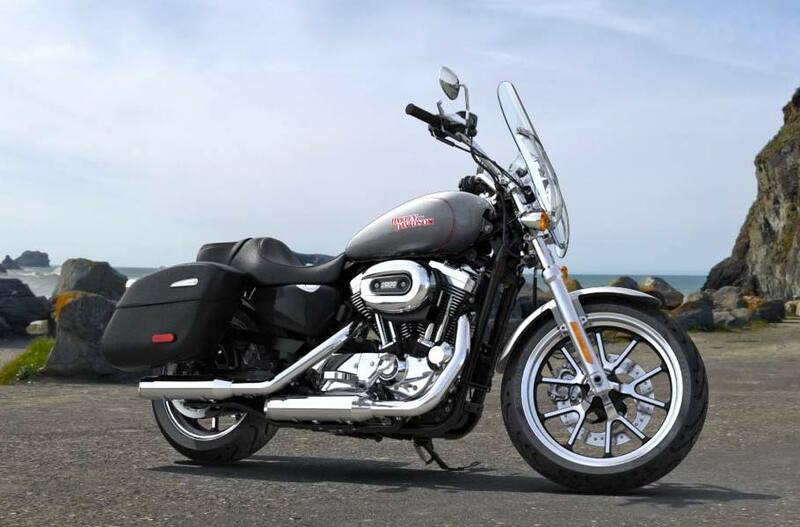 This closed loop exhaust system delivers heart-pounding performance in the key of the trademark Harley-Davidson rumble. With its robust, soul-stirring big twin design, durable mufflers with exhaust shields, a catalyst and mini heated oxygen sensors that improve emissions and drivability, this system is not only better for the environment, it makes riding better. Wrinkle Black Console with Speedometer, Tach and Gear Indicator: Even though none of us would want to admit it, from time to time, we've all had to kick our shift lever back down to 1 to figure out what gear we were in. The SuperLow® 1200T model gives you a speedometer with a gear indicator readout and a tachometer that can be activated by your trip switch. Now you've got all the information you need to keep it in the power band at the touch of a finger. Pure Harley-Davidson Styling: Feast your eyes on the 1200cc Evolution® engine and there's no mistaking its roots. This is authentic Harley-Davidson style through and through with an attention to detail you won't find from any other motorcycle company. Chrome and wrinkle black cylinders topped off by chrome cylinder heads and chrome rocker covers, while chrome pushrods highlight the iconic V-Twin. It's a jewel machined out of metal. Pure. Dripping with power. From the classic edge of the cooling fins to the clean lines of cases and covers—the 1200cc Evolution® engine makes an ironclad statement about holding on to what's right and staying true to what satisfies the rider. Evolution Engine: The Evolution® engine – known in certain crowds as the Blockhead – was first bolted to the frame of a Harley-Davidson® motorcycle back in 1984. Born from legendary Shovelhead and Ironhead engines, the Evolution® engine broke new ground in displacement innovation while maintaining the hunger for power, durability and proven reliability that The Motor Company was built on. Evolution® Engine Innovation: Air-cooled and durable as hell, the 1200cc Evolution® engine is yet another nod to the unwavering work ethic that drives advancements in motor technology at Harley-Davidson. Aluminum heads and cylinders lighten the load of the bike and improve air-cooling efficiency. Electronic fuel injection says goodbye to carburetors and boasts increased reliability and less routine maintenance. Bottom line: the rubber-mounted Evolution® engine runs hard and rides smooth for thousands of miles so you can just worry about taking in the freedom of the open road. Foundation Brake System: Like riding itself, you can never go too far when it comes to improving a bike’s brakes. This is why we gave the brake system of each Sportster® model a complete overhaul designed to improve performance, fit and finish. You have 300mm brake rotors and a powerful, stylized front caliper with 34mm pistons and stylized rear caliper to match. Other system features include an improved all-aluminum integrated rear master cylinder with reservoir, all-aluminum front master cylinder with reduced friction and higher efficiency, and stainless steel braided lines. It all adds up to more confidence on the road and more power and predictability when you squeeze the brakes. Low Seat Height: There’s a reason we named this motorcycle the SuperLow® 1200T. The seat is just 25.5 inches off the ground. That low seat height, combined with the narrow frame, and the narrow nose seat, makes it easy to maneuver your ride through turns and down straights at any speed from parking lot to interstate. And reach the ground when you stop. If you’re looking for a motorcycle you can feel confident to go on, look no further. Final Drive Ratio: The final drive ratio on the SuperLow® 1200T model is dialed in for smooth handling at low speeds and easy, quick acceleration off the line. It’s coupled with electronic fuel injection for instant response and easy handling. So you can be confident that your motorcycle will respond when you roll on the throttle. Michelin® Scorcher™ Tires: Michelin® Scorcher™ tires provide the superior performance, sensational grip, impressive durability and excellent handling expected on a race-bred bike. The exclusive deep-cut tread design improves grip and water evacuation capability. Grip performance and durability is also enhanced by the tire's rubber compounds, which use the latest generation of Michelin synthetic polymers. Adjustable Rear Shocks: The SuperLow® 1200T model has a dial adjust emulsion shock and twin tube system. You can tune your suspension to match your riding style, or to accommodate full saddlebags and a passenger without removing the saddlebags or purchasing any special tools. Just dial in your ride and roll. Relocated Mid-Mount Controls: The SuperLow® 1200T model gives you the confidence-inspiring riding position that comes from mid-mount foot controls. Your feet are right where you want them to be, with an easy reach to the ground when it’s time to stop. Your knees ride naturally next to the tank for a good center of gravity and balance in the corners. And the controls have been re-positioned to give you easy access to the jiffy stand. Comfortable Cockpit: A combination of a low bucket seat, longer travel rear suspension and easy-grip handlebar creates a comfortable riding position for a wide range of riders. Ergonomically sound, this bike helps build confidence in all aspects of your journey—from lifting it off its side stand to handling and turning, and every bump, twisty and stop in between. Rider Mini Footboards: As the old saying goes, “Take care of your feet, and your feet will take care of you”. When you’re on the Sportster® SuperLow® 1200T model, your feet are riding on mini footboards that give you more comfort and support than pegs. The more comfortable you are, the farther you want to ride. Gauges: Handlebar-mounted electronic speedometer with odometer, time-of-day clock on odometer, dual tripmeter, low fuel warning light, low oil pressure light, engine diagnostics readout, LED indicator lights, gear and rpm indicator. Every Day: 9:00 a.m. - 6:00 p.m.